There has been quite a bit of excitement here at Old Faithful since yesterday afternoon, when a lucky group of park visitors saw a group of wolves kill an elk in the Firehole River not far north of Biscuit Basin. I was on duty at the visitor center both yesterday and today, and so have not been out to view the kill myself yet. I got to see some dramatic photos taken by snowcoach and snowmobile guides, though, and all I can say is WOW. It seems as though a group of four wolves, three grays and one near-white, took down a cow elk. She died in the river and the wolves expended a fair amount of effort yesterday trying to drag her carcass out onto the snowy riverbank. Though they moved the elk’s body over the the edge of the river, it was too heavy or bulky for them to pull onto land. Visitors, guides, and at least a handful of park employees got to see the wolves feeding on the kill as the sunlight faded late in the afternoon. After eating, the wolves cleaned themselves up by wiping their bloody muzzles on the snow. Today, the word was out, and it seemed as though all the guided groups stopped near the kill site to watch the carcass. A few groups saw wolves feeding. Many others saw scavengers, including ravens, coyotes, and bald eagles. Though I haven’t yet been to the kill site myself, I did see wolf tracks in the snow near Scalloped Spring yesterday morning, while I was skiing the Upper Geyser Basin as part of my geyser prediction duties. They were the first sign of wolves I had seen in the Old Faithful area this season. These tracks are bigger than they look. 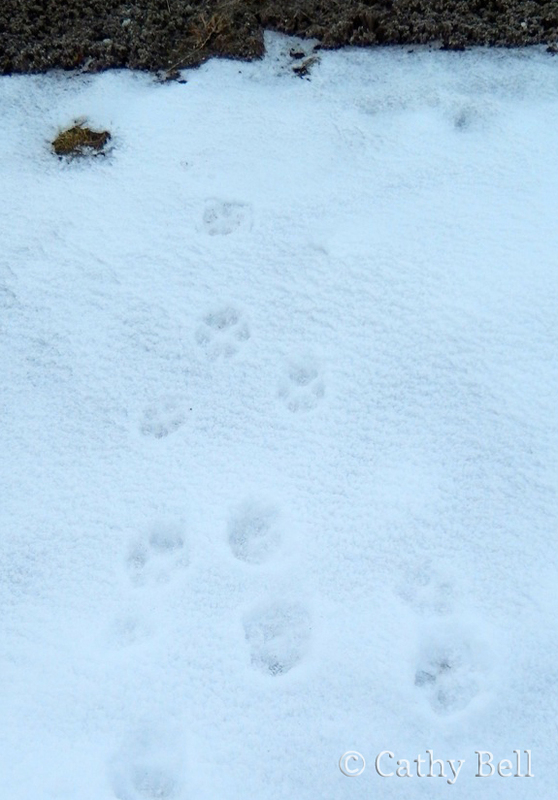 I’m looking forward to my day off tomorrow, crossing my fingers that I’ll see wolves, and not just their tracks! Even if I don’t see any of the big canids, though, I’m glad to know they’re out there. How exciting! The near white wolf is the alpha female of the Canyon Pack, and they do make it all the way to Old Faithful during the snowy season. They are once of the widest ranging packs in the park, wintering mainly in the Mammoth area but traveling extensively to Norris and Old Faithful even. What a wonderful treat for you! The Canyon pack is definitely seeming most likely. Have you seen pictures from this kill (i.e., do you feel confident it’s the same wolf as the Canyon alpha)? There are other very light wolves out there. After posting this last night, a friend messaged me to say that a Snow Lodge employee had pictures of a collared dark wolf at Whiskey Flat. Do you know if the Canyon Pack has a collar on a dark individual? No one that I know of has seen that dark wolf at the kill site, but Whiskey Flat is definitely the same neighborhood. I should add that the Cougar Pack apparently has a lot of dark wolves, making it seem unlikely that they’re the ones involved. I haven’t seen pictures, Cathy. Just guessing, especially since the Canyons are seen in your area there pretty regularly. There is another almost white wolf: she’s the alpha female of the Bechler pack, whose territory is kind of near you. 712M is a dark collared wolf in the pack. He’s big, being a former Mollie’s member, and has gray cheeks and sides — he and the almost white alpha female have been a pair since 2007. That makes sense to me. I’ll be curious to know if the wolf project folks have been down to look at the carcass yet.